Springtime and gardens have inspired different designs of colour, illustration, bookbinding and paper-making. 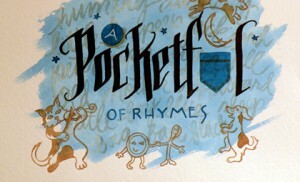 A Pocketful of Rhymes explores the possibilities in an exhibition from the Westcoast Calligraphy Society that has travelled to sites throughout the Lower Mainland. The exhibition is currently on display until July 29 in the main foyer (level two) of the Irving K. Barber Learning Centre; Professor Judi Saltman from UBC’s School of Library, Archival, and Information Studies will provide an accompanying public lecture on July 26. For more information about the exhibition, please contact UBC Library’s Susan Andrews (susan.andrews@ubc.ca) or Allan Cho (allan.cho@ubc.ca).